Finally, the London 2012 Olympic Flame has reached Wimbledon after travelling through many prime areas in London including Mitcham Town Centre, Wimbledon, and the Colliers Wood. During the south London Relay on 23 July 2012, the torch went close to both Wimbledon Common and Wimbledon Village. The London Organising Committee of the Olympic and Paralympic Games announced the route of the Torch Relay for the Olympics. The announcement also included a list of selected Torchbearers including residents, local schools, and businesses within the borough. Even, there were four party areas and performance spaces. It was definitely a proud moment for the local councillors to be a host borough for the London 2012 Olympic Games. In addition, this is a unique opportunity for all the locals to witness the Olympic Torch. They encouraged all those who live and work in Merton to take part in this historic event. Most of the local businesses were pleased to see the successful turn out for the torch relay. This also has a positive impact on the local economy. The major reason can be the increasing number of property renters in the area over the course of the Olympics Games. The Olympic torch relay also included a special transfer on London's tube network. The transfer was complete without any hassle and it was definitely a relief to the game organisers. John Light, a 64 year old tube train driver carried the torch in the designated train cab, adorned with the Olympic rings for the 67th day of the torch relay. After serving for the London Underground since 1963, Mr Light was chosen for this honorable work. He mentioned that it was his pleasure to be a part of the transportation of the Olympic flame. He did mention about his 49 years service for London Underground after his spectacular Tube journey with the renowned Olympics Torch. After its journey in the tube train, the torch travelled from Kingston to Ealing while passing upon the Thames River. During this nationwide relay to Ealing, the torch also passed through the famous Kew Gardens. To make this event a memorable one, volunteers at the gardens created a spectacular 50m long Olympic ring structure out of 20,000 plants. British tennis player Oliver Golding was also amongst the torchbearers for London Olympics 2012. He stood at the centre of the rings for this event. 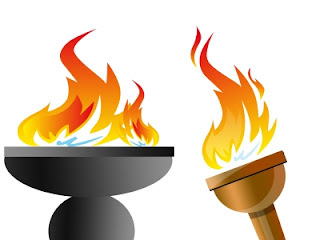 Other celebrities amongst 144 torchbearers include the double Olympic rowing champion James Cracknell, singer Katy B, skier Chemy Alcott, and music producer Mark Ronson. Cracknell was the lucky one to be the day's first torchbearer who ran with the torch across the Hook Community Centre in Kingston. Other star torchbearers were the renowned skeleton racer Adam Pengilly who carried the flame in Kingston. Sir Paul McCartney is supposed to perform at the closing ceremony of London 2012. Mark Ronson, the famous Grammy award-winning producer along with singer Katy B carried the torch at Brunel University in west London on day 67 of the torch relay. Visit Rober Holmes and browse through our list of properties which may be of interest to you. With years of experience in the local area as well as promoting one of the best selections of properties we are sure we can help you find your dream home or the right tenants for your property.